As the Qatar's leading and leading document certification providers and pro service agency, Kenza services help and support our customers to have quality services. Kenza services pay attention to customer's satisfaction first. We are promised to provide 100% dedicated services at the most competitive charges. We are very proud with our deliberate services and quality assurance. 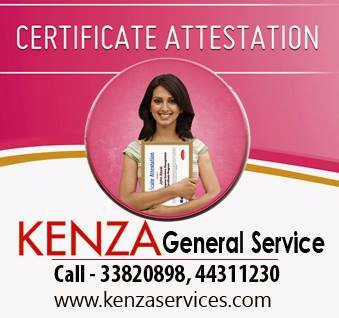 From this sole perspective to services, Kenza have made the top HRD, certification Attestation & Apostille stamping company in Qatar with the largest customer base.